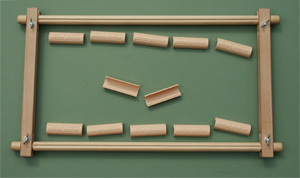 With a clip frame, there is no need to get out your needle and thread to sew your canvas to the roller bars. Simply clip the canvas on and away you go without delay. Marvelous! The frame looks like a normal frame, but there is a groove in each roller bar for the clips and a generous quantity of clips supplied in case you lose one or two. If you like to swap between projects, it is now such a quick and simple matter to change canvases. Full illustrated instructions included in the pack but it is worth reading these additional notes about Assembling your frame and canvas. If you would like to discuss tapestry frames, I am always happy to help. Telephone: 01403 782200. Or see more at Tapestry Frames. Unfortunately, we can only post to UK addresses.